If you're a social media junkie like we are, you've most likely caught the buzz about the soon-to-be-opened Cake Eater Bakery via Twitter or Facebook. And today the official announcement was tweeted: Cake Eater will open to the public next Monday! 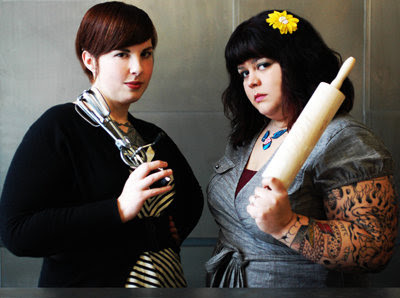 Cupcake gurus and LOL/OMG pals Sheela Namakkal and Emily Harris make some of the sweetest and most creative treats in town (trust us, we've tried them!) and we're pretty sure their new shop -- located in the old Cliquot Club space -- will be a smash hit. Personally, we plan on being regulars and may even take our cupcakes with a side of wi-fi, so we can blog at you while getting sugar high. Opening to the public next Monday, April 5th, Cake Eater will have many sweet AND savory items as well as Intelligentsia Coffee to get ya wired. The shop boasts a fun "Bollywood meets Marie Antoinette" theme with a punk rock twist and will even host regular cupcake happy hours. So cute!!! Over on Facebook it says they're opening Saturday! That's two whole extra days of cupcakes! Yes! Awesome! I know they said the soft launch was on Saturday but it was for "friends, family, neighbors and press" but they are pumping it on their facebook and telling people to come, so yeah! Go eat some cupcakes on Saturday!